This word cloud represents terms that either characterize Melinda or that Melinda uses to characterize herself over the course of the novel. The conflicting attitudes and emotions that these terms represent demonstrate Melinda's internal conflict as she decides whether to speak up about her assault or not. She wants to "just tell someone" (Anderson, 2011, p. 101), but she is unable to talk about it. The darkness surrounding the outline illustrates others' lack of understanding about what happened to Melinda and the resulting lack of empathy she must face. Her friend Heather sees her sadness as off-putting, calling her "the most depressed person I've ever met," while her parents think her social withdrawal and lack of interest in school are simply attempts to "get attention" (Anderson, 2011, pp. 105, 114). ​The words afraid, silent, growing, and artist in particular are larger than the others because they represent the primary identities and behaviors Melinda assumes to deal with her assault. She feels like an outcast because of her experience, thinking that she has a scarlet letter branding her to other people: "S for silent, for stupid, for scared" (Anderson, 2011, p. 101). Additionally, she avoids speaking about her experience because she does not want to relive it, noting that "the whole point of not talking about it, of silencing the memory, is to make it go away. It won't" (Anderson, 2011, p. 82). However, she is able to use her work as an artist to develop as a person despite her pain, finding "new growth" (Anderson, 2011, p. 196) in herself as she draws a tree. 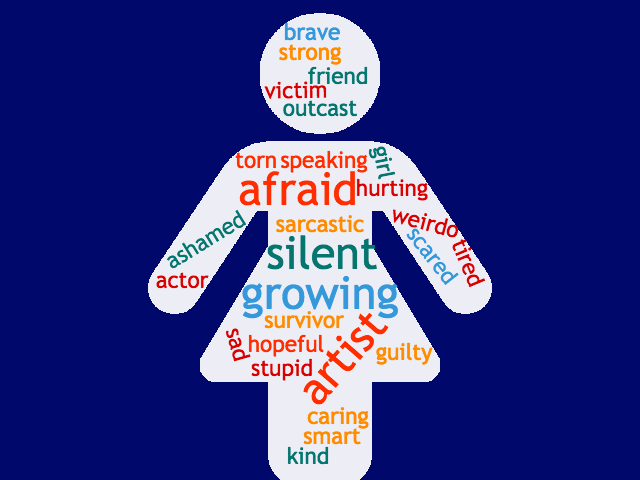 Moreover, the conflicting words in the outline represent Melinda's complexity as a character; her assault does not define her, although it causes her pain. She declares of her assault at the end of the book, "I'm not going to let it kill me. I can grow" (Anderson, 2011, p. 196). A choral reading is an oral presentation of a previously scripted text. The choral reading below is comprised of reactions that Melinda's schoolmates and parents have to Melinda's trauma. It illustrates how her external conflicts with these figures amplify the internal conflict that she has about sharing her story. Choral readings are usually designed for multiple voices. However, in this instance one person (myself) reads these words to illustrate how the voices dissuading Melinda from speaking up influence and intermingle with her own voice.